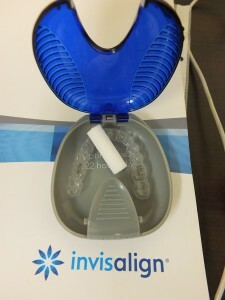 Allstar Orthodontics > About Allstar > Blog > Invisalign Chewies: What are they and how do I use them? Purple with grape flavour, yellow with pineapple flavour, green with mint flavour, pink with bubblegum flavour or white unscented. The white unscented chewies are the most popular. The Invisalign chewie should be used at least twice a day. When the Invisalign aligner is put back in after eating the chewie should be used to bite the Invisalign firmly into position. Position the chewie between your teeth (either ‘longways’ or ‘shortways’ and bite down. Move it from one end of your mouth to the other continuing to bite up and down until you have bitten on it with all of your teeth. Then go back and do it again. It is important that the Invisalign is fully seated onto the tooth so that it can then be effective in moving the teeth. The chewie should be used for at least 20 seconds each time. The chewie is small enough to fit into the case with the Invisalign so it can be carried with you through the day.